It was exciting to see most of the 14U team from last year come together again this year and see how much they have grown and matured, and to welcome one new very energetic teammate! A new season needed a new name for the 15U Girls Black – the “Mighty Ninjas” – born of the coaches’ inspiration. The season started off with the team hosting for Durham Attack the 15U Provincial Cup Championship East division on November 8/14 in in Bowmanville. While Manager Rose did a stellar job convening and parents ran around doing assorted hosting tasks, the Ninjas had a triumphant start to the day, winning all their games in 2 straight sets in pool play and Quarter Finals. And then…the team name they dread was heard… and the Ninjas had to face their nemesis from the last two seasons, Scarborough Titans Tektonics, in the Semi Finals. 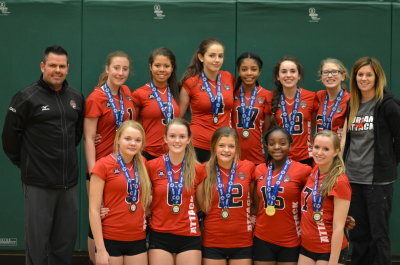 The two rivals have met many times in Gold Medal matches, but facing each other in the semis was due to unlucky seeding based on the results of last year’s provincials where DA 14U Black won Silver and Tektonics was knocked out of the medals. Meeting in the semis meant one of the two teams was not going to be going to the Gold Medal match, so the fight was on. What ensued was volleyball of a caliber that blew everyone away as both teams pulled out their very best effort. As is always the way with these teams, one is never more than a couple of points ahead, and the lead flips back and forth between them so many times you can never predict who will win. Battling neck-and-neck, point for point, Mighty Ninjas were ecstatic to take the first set 25-23, but Tektonics were not backing down, fighting for a breathtaking win in the 2nd set 28-26, and as has been the nail-biting pattern with these two teams, the win would have to be determined in a 3rd set. Rally after exciting rally, with huge hits, saves, and amazing serving, the teams wowed the spectators with the excitement, intensity, incredible skill and teamwork – and heart – they showed – some visitors said they felt like they had paid to see a professional match! Sadly for Mighty Ninjas, Tektonics edged ahead just enough at the wrong moment to take the 3rd set 15-13, relegating the Ninjas to the Bronze medal match vs. Markham Stingers WASPS. Mighty Ninjas, must have left their best on the court in the semis though, and lost two straight, leaving the Bronze medal to the WASPS. Despite the disappointing result in the end, Mighty Ninjas certainly could feel proud of their otherwise very successful day, including their stellar play in the semi-final game which but for a couple of key points could have been a victory. First a Silver, then GOLD in 16U Championship East for 15U Girls Mighty Ninjas!! !